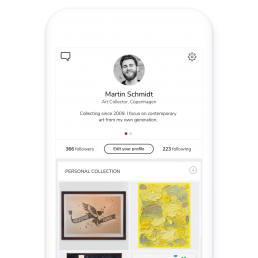 FAQ – Artland – the social network for art collectors and galleries. Welcome to our FAQ for Artland app users and galleries. We hope you will find the answers you are looking for. Did you not find the answer you were looking for? Please contact us on info@artlandapp.com and we will be happy to help. + What is your full name and email? Let us know at info@artlandapp.com or below. Simply click the plus in the tab bar. Remember only to upload artworks that you own. How can I edit information about an artwork? Access the artwork on your profile and click the three dots under the image. How can I delete an artwork? Go to the artwork on your profile and click the three dots under the image. Please let us know at info@artlandapp.com or below. How can I be featured in Discover? I am an artist. Can I still use the app? Yes, of course. Artland is for everyone, and you, as an artist, are truly at the center of the art world. However, at the moment, we dont accept that artists upload their own produced works in the app. If you have an art collection with works from fellow artists, you are very welcome to share it in Artland. How can I get a customized feed? This feature is under development. Stay tuned! Something is not working. How can I let Artland know? A gallery is not represented in the app. How can I add one? How do I claim a gallery? Download Artland app, go to Settings on the profile tab (upper right corner), scroll down and tab ‘Claim gallery’. Voilà! How do I change from a user profile to a gallery profile? If you want to change from a user profile to a gallery profile, go to Settings (on the profile tab), scroll down and click the tab ‘Claim gallery’. My gallery is not represented in the app. How can I add it? How can I upload artworks for sale? If you have changed to a gallery profile, simply click “Add artworks for sale” on your gallery profile. There is wrong information about an artist in the gallery. How to change? How to change the gallery email address? Please let us know at info@artlandapp.com or below, if you want to change the gallery email address.